No. 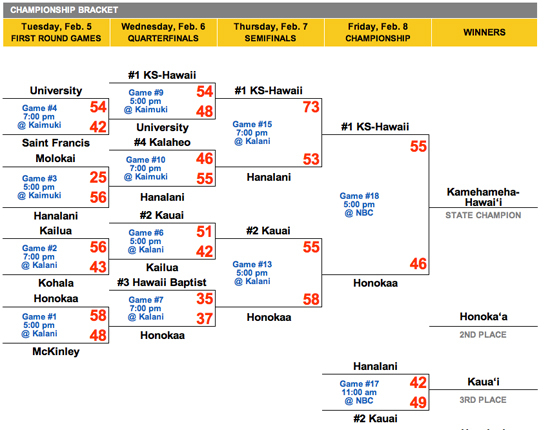 1 seed Kamehameha Schools Hawaii topped unseeded Honokaa, 55-46, to win its second straight state title. In the Division I championship match-up, No. 1 seed Konawaena was the favorite going up against No. 2 seed Kamehameha Schools Kapalama. Konawaena came out strong, building up a 22-9 lead at halftime and at one point in the third quarter had a 20-point lead. However, Kapalama stunned the two-time champs with a 27-point fourth quarter and handed Konawaena its first loss of the season, 45-39. 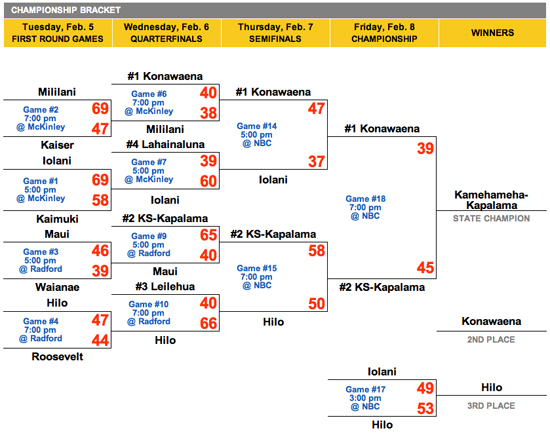 Meanwhile, Hilo squeaked past Iolani, 53-49, to take third place. The tournament was Feb. 5-8 at McKinley High School, Radford High School and Blaisdell Arena on Oahu.